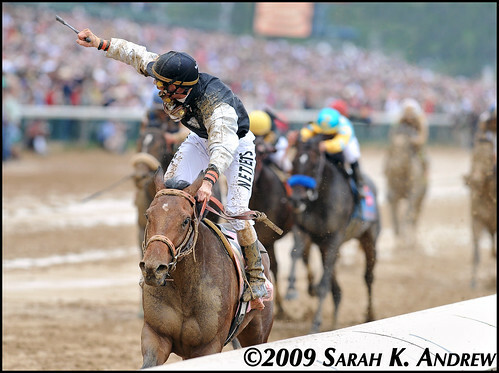 2009 Kentucky Derby winner Mine That Bird makes the first start of his 4-year-old campaign today in the Grade 2 Firecracker Handicap at Churchill Downs. This will be his first attempt at turf. You may remember that Mine That Bird spent his 2-year-old campaign at Woodbine running on synthetics and won several stakes races including the Grade 3 Grey. His only win on dirt came over the slop, but can he also get a graded win on turf? We’ll see! Update: Mine That Bird was off the board but Prioress winner Franny Freud is an Omnisurface Star! We’ll add her in a bit. This entry was posted on Sunday, July 4th, 2010 at 10:47 am	and is filed under Omnisurface Watch. You can follow any responses to this entry through the RSS 2.0 feed. Both comments and pings are currently closed.